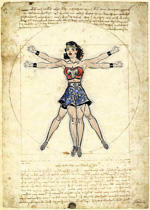 Robert Kanigher wrote Wonder Woman in a peculiar steam-of-consciousness way that reads a lot like dreams in comic form. In the second story in the Showcase collection Steve Trevor is for no explained reason now piloting a rocket plane to chase and observe an experimental rocket. (1). Unexpectedly, Steve's plane accelerates faster than the rocket and disappears into space, so Wonder Woman gets her invisible plane a quick refit at Paradise Island and follows, also becoming caught by the strange effect and sent hurtling across space. Once she's retrieved her wayward boyfriend, she observes the Earth being destroyed by a flaming meteor, except no, it's only a cardboard cutout of the Earth that evil aliens were using for target practice, because they feed on planetary fragments, and Earth is next on the menu, even though it's 200 light years away and there are plenty of uninhabited planets closer (2). And they appear to have brought the reluctant astronauts from their home purely to gloat at them (3). Tough for them that Wonder Woman can fashion a giant magnet out of the nearby landscape and use it to pull the meteors off course and send them crashing back to the planet that launched them (4). Of course now Wondy and Steve are stranded in space, hundreds of light years from home, except what's this? Could it be a handy spacewarp that will return them to Earth space? You can bet it is. It's only with the third story that some of Kanigher's less entertaining themes become explicit. The problem is the relationship between Wonder Woman and Steve Trevor. Personally I've never been able to understand why she puts up with his nagging. The situation is that Steve wants Wondy to marry him and settle down, i.e. stop going out and doing hero stuff. Wondy's response is that she cannot marry him until she is no longer needed to battle crimes and injustice. Only then can she think about herself. This is a twist on silver age Superman's lame excuse for refusing to marry Lois Lane. Here Wonder Woman has to put the concerns of the whole world before herself until she is no longer needed, and her definition of being needed is impossible to fulfil, since it not only requires there to be no crime and injustice, but no natural disasters too. And yet rather than challenge this absurd notion, Steve instead repeatedly attempts to trick the woman he claims to love into marrying him. It seems to be far more about control than love, and it's my least favourite aspect of these stories. But back to the plot: this story completely rewrites part of the origin story, with an entirely new telling of how Wonder Woman became Diana Prince and came to work at Steve's office in Military Intelligence. In this variation Steve bets Wondy that if he can find her three times in 24 hours, regardless of how she is disguised or hidden, then she will marry him. When she finds that he has tricked her, she gets her own back by applying for a job in his own office (5) so that she'll be right under his nose all the time without him recognising her. Would I recommend this as a book to give to kids? On the one hand the stories are light and fantastic, bursting with sense of wonder and fairytale logic, while short and self-contained, but on the other they have some underlying values that I would be uncomfortable exposing to someone who was not experienced enough to recognise them as the BS they are and able to reject them while still enjoying the rest of the story. Don't get me wrong, I love this stuff, but that doesn't mean I don't see elements in it I don't like. 1) We are told that the plane is slower than the rocket, so I doubt it can be observing it for very long. 2) I can only assume that Earth is a particularly tasty morsel on the galactic menu, since it seems to attract planet eaters from across the galaxy. 3) no better explanation is given, and that's all they actually do with them. 4) She never did have an actual code against killing, did she?